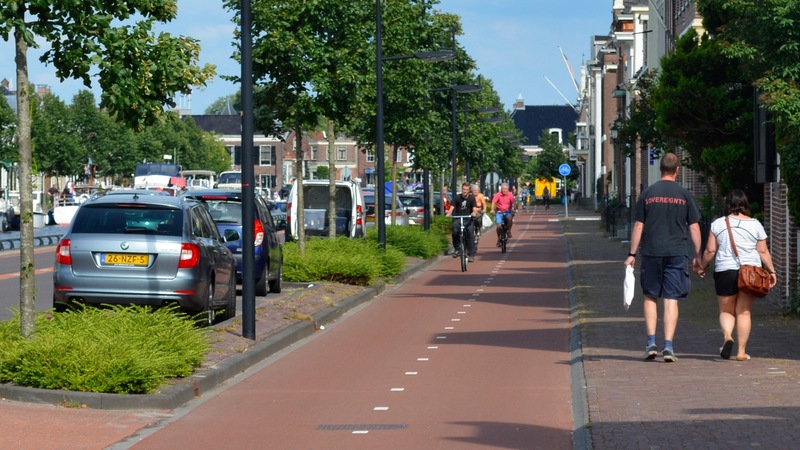 ← Is it really impossible to build cycleways past residential properties? 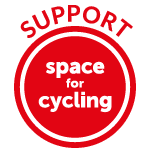 But – just as with cycling infrastructure in general – poor implementation of a particular concept doesn’t mean that concept itself should be ruled entirely. Britain has, in recent history, built a great deal of pretty awful attempts at protected cycleways on main roads, but that doesn’t mean protected cycleways aren’t a very good idea, if they are implemented properly. And precisely the same is true for underpasses. 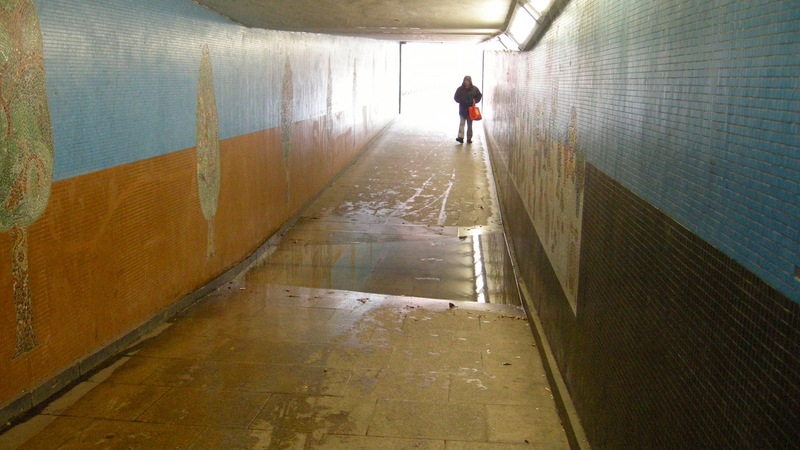 All too often British underpasses are murky, poorly lit, prone to flooding, inconvenient, socially unsafe – or all of the above. These are the kinds of pictures developers and councils use to argue that pedestrians (and people cycling) prefer at-grade crossings – crossings at surface level, where motor traffic has to be dealt with at signalised crossings (or just by dashing across the road). ‘At grade’ crossings are generally more attractive to pedestrians and cyclists due to reduced distances and the avoidance of ramps or stairs, so are the preferred solution. Of course, this is context-dependent. Underpasses shouldn’t be used in town centre locations. These are places which should not really be carrying the motor traffic levels that make underpasses an attractive alternative (or should be an attractive alternative). However, if the road being crossed is a major through-road, or a very busy distributor road, typically with high motor traffic speeds, then I would argue that underpasses (and to a lesser extent bridges), rather than surface crossings, are actually essential. For a start, failing to provide an underpass doesn’t magically address the severance problem presented by the road. It still has to be crossed, and that will be much more inconvenient with a series of signalised crossings, which will introduce delay (how much delay depends on the number of crossings and the willingness of the highway authority to allocate time to walking and cycling across busy roads). Underpasses present no delay whatsoever – as they are totally separate from the road system, they can be cycled (and walked) through with impunity. Likewise underpasses present none of the safety issues that might arise with an at-grade crossing, particularly the temptation to dash across the road if (as is most likely) there is considerable delay waiting for a green signal to cross. And underpasses do not have to look like the dirty and grimy British examples presented here. They can be light, airy and well-lit. 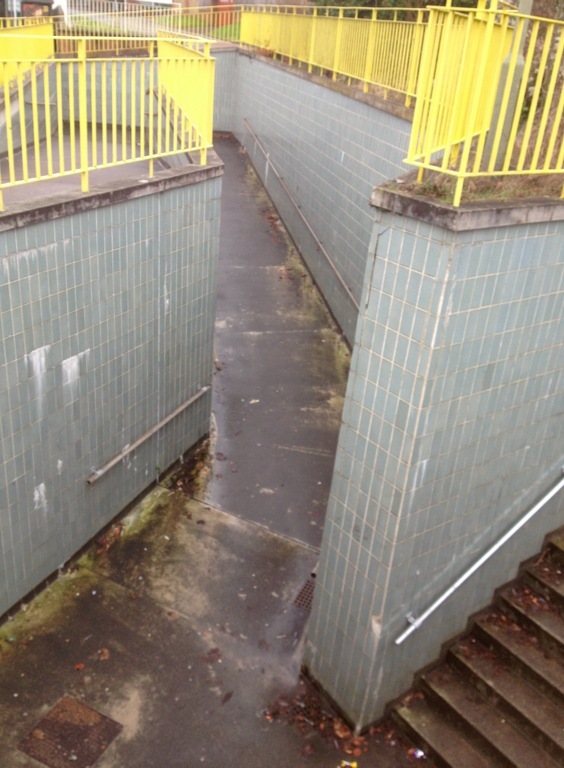 This same underpass is also surrounded by housing, is open, and overlooked – it feels like it is connected to the neighbourhood, ensuring high levels of social safety. So, in short, the problems with ‘British’ underpasses are not innate problems with underpasses in general. With care and effort (and expenditure!) underpasses can be genuinely attractive and safe, particularly because they do not involve interactions with motor traffic on the fast and busy road that would have to be crossed at surface level. And underpasses can also be used strategically to privilege walking and cycling, by creating direct routes that simply don’t exist for motor traffic. The underpass that features in these three photographs here is a brilliant example. It forms part of a dead straight desire line, connecting the centre of one new development with the centre of another, crossing a four carriageway N-road (the equivalent of a British A-road), a railway and a service road. This route does not exist for motor traffic, which has to go the long way round, using the N-road (a through-road) that the underpass itself passes under. The underpass lies along the red line. Motor traffic obviously cannot use this underpass; the best available route is illustrated in blue. 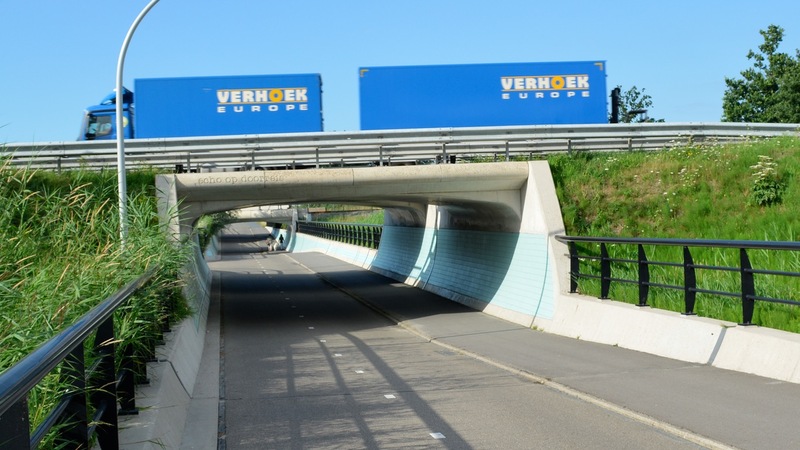 Underpasses can obviously be poorly designed, and placed in locations where the priority should be to create an attractive surface environment, with reduced motor traffic levels – particularly within urban areas. But that should not blind us to the fact that they can and should be used strategically as part of safe, convenient routes for walking and cycling, where major roads that are in the right places (bypasses, for instance) have to be crossed, providing direct routes for these modes that don’t exist for driving. 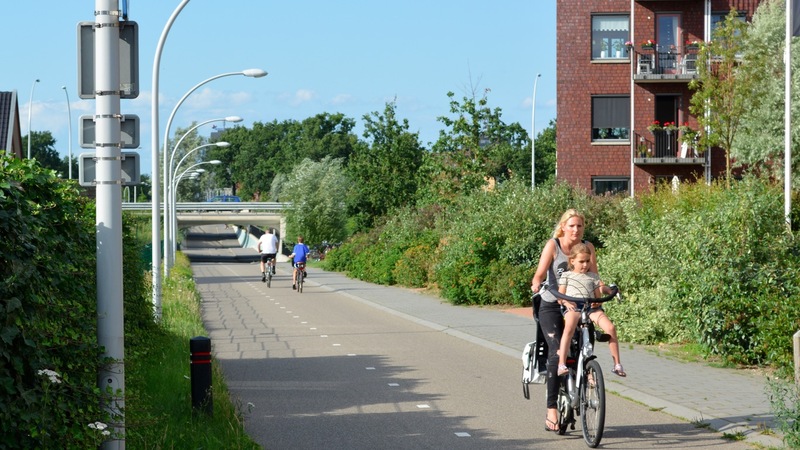 This entry was posted in Infrastructure, Social safety, Subjective safety, Sustainable Safety, The Netherlands, Town planning, Underpass. Bookmark the permalink. Another insightful and incisive piece. Clear design standards are required, as article demonstrates – straight, wide, well-lit, approaches with gentle slopes and, probably most importantly, people are able to see through to light at the other end from the point where they decide whether to use it or not. New towns, such as Harlow, are probably the most interesting examples of underpasses. There you have the pretty unique situation of the original pattern of foot/bridleways and country lanes conserved exclusively for walking/cycling and a grid pattern for motors superimposed on top with pretty much no ‘at grade’ crossings. They even put most Dutch examples in the shade. They prove just what is possible in this country. Where they fail is that new towns were already designed around motors – geographically widely dispersed, low density, multi-carriageway roads – which mean, unlike traditional towns/cities few of the ‘push’ factors actually to encourage walking/cycling in the first place. I recall several years ago writing to Surrey CC to object to a proposed closure of a right-turn across the central reservation of the A3 at Milford, just south of Godalming. The proposal was motivated by safety concerns – right turning vehicles would have to cross two lanes of fast-moving and often quite heavy traffic going in the opposite direction so the risks are obvious – but for parents taking their children to school would imply a five mile detour, up to the next exit slip, round the roundabout and back either on the A3 southbound or on a parallel A road. I wasn’t as familiar then as I am now with cyclist and pedestrian issues, and my objection centred on environmental grounds – probable doubling of a car journey in one direction (the return journey would not be affected) and the additional CO2 generated. To excuse myself, I would say that it was never practical to use an alternative to the car here – the distance and the hostility of the roads rules out walking or cycling, and a small village community in a rural area slightly off the beaten track was unlikely to get a bus service – but in your example, and almost any other urban example, the green credentials of any argument to permit more direct motor traffic access can be quickly exploded by pointing out that the car journey, even so extended, might only take 5 minutes but the direct walk/cycle route would take about the same. Unless you are carrying a wardrobe or a double bass it really isn’t necessary to use a car. Of course we have seen a live example of this only in the last few day, where car-dependent residents around the permeability trial at Loughborough Junction in Lambeth are whining about their car journeys which used to take 5 minutes now taking 20. 5 minutes in the country could easily be 3 miles or more, but in central London cannot realistically be as much as one mile. Why are they not walking or cycling already? Probably, in their defence, the conditions in Lambeth are pretty hostile to walking or cycling, but then isn’t that what the Loughborough junction scheme is about? I do hope the reports of the trial’s premature abandonment are false, and I do hope Lambeth grows some balls and tells the objectors to sling their hooks at least until the trial completes and can be properly evaluated. The filtering was described as ‘like the Berlin Wall, cutting one side of the estate off from the other and cutting us off from Brixton and Camberwell”. If people are actually driving within the estate or the 0.9mile to either of those centres there is such an uphill battle to climb. Even residents who claim to walk and cycle and only use their car at weekends can’t imagine a world any different from the one they have now. It’s so depressing. There is a good British example (a rare combination) in Windsor. Absolutely! And there is no excuse not to do so either being as how google have trikes to map out the strangest of places on Earth. Underpasses work fine in Stevenage, Harlow. We can do it in the UK. 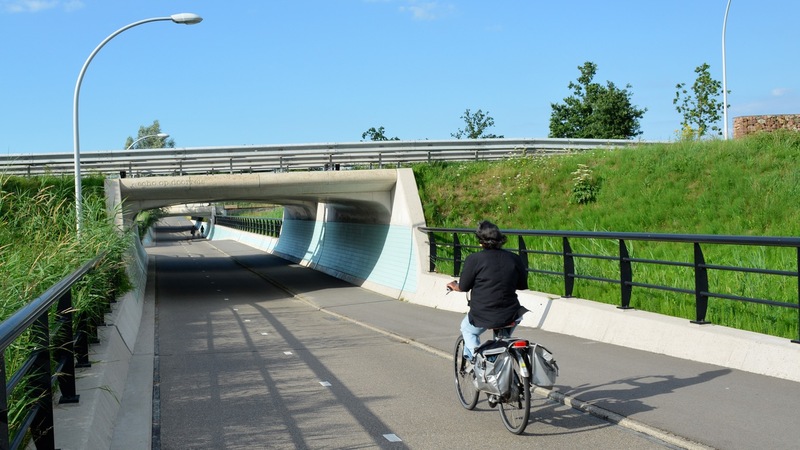 The Dutch example looks more like a bridge over the active travel facility than an underpass. Maybe that’s how we should talk about them, ‘underpass’ continues to put the focus on the carriageway. Agreed, it’s a bridge rather than an underpass. The two roads (motor and cycle) continue at more or less their own levels. In addition to altering the focus, that makes a lot of difference in terms of architecture; more natural light and better drainage to name the two most obvious. I loved underpasses in Japan. In Gunma there was this walking/biking trail up one of the rivers that I used for commuting to my work. This was built in the 80’s as well as the dual carriageway and park it leads to, there is plenty of room to have built this properly and even raise the dual carriageway upwards so the underpass doesn’t need to go down so far but of course that would require spending more than a few pennies. 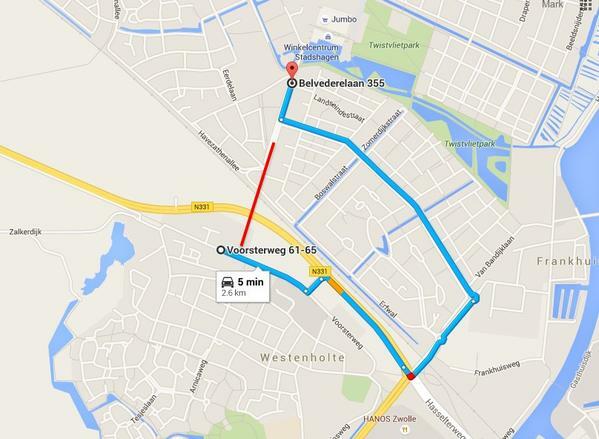 I also like this idea in the Netherlands, https://goo.gl/maps/Whw2oH19K8o, lowering the road so a bridge across only needs minimal slope, and its probably cheaper as a foot/cycle bridge doesn’t need the strength of a road bridge. Close to the Dutch bridge you mention there is also the opposite – if you look in the opposite direction a bit further, you get at https://goo.gl/maps/oWZxuRuSeDN2 : The road (there is actually a roundabout coming) is heightened, so the underpass can remain at-level – as agpsmith says, it’s more a bridge than an underpass. This has been the standard of infrastructure in all the Canberra suburbs from the late 1960’s to the present day, and integrates heavily with flood management infrastructure; the paths following or doubling as drains for extreme weather events, flowing into retaining basins that function as local ovals/parks/sports grounds during normal weather. Part of extensive infrastructure including on and off road paths for cycling, recognising their different uses and purposes. meltdblog, a quick zoom out and view on earth mode on your streetview link would lead me to assume they are used rarely other than for recreational purposes. I would assume this because although the green lines show a lot of off road paths the over use of cul-de-sacs makes the streets impermeable when you probably have to walk/cycle double the distance to get to your destination, reinforcing car dependency. The use of cul-de-sacs is no longer recommended in the UK manual for streets for this reason, although I still see plenty of new developments built in this way still, which they shouldn’t. The Netherlands appear to only use street patterns so they are all connected. Other things that the Dutch have done to reduce the social safety problem is reduce the frequency of crime in the first place. Their criminal justice system is extremely good at reducing the number of people incarcerated. So low is the number that for the sake of the guard’s jobs they imported some prisoners from Belgium so as to keep the guards employed at what they do best. And it’s been declining for a long time at a rapid rate. Just a few thousand prisoners in a country of over 16 million. It’s quite similar to Sweden and Norway. People doing drugs aren’t in these underpasses, partly because people would be more likely to see them, and that they are well lit on fairly busy cycle routes. They are usually either consuming drugs in a coffee shop or if my memory is correct on which country does this, approved injection clinics (google it, I’m being serious). Of course keeping the cycle routes busy and ensuring that they are well lit at night and with underpasses with nowhere to lean against, vandal resistant walls and being open and airy does make a huge difference.